First of all, to get back deleted or lost Viber call record & messages is possible! In this article, I will take about how to recover Viber data from iTunes backup file. And actually, you still can choose to restore Viber data from iCloud backup file and even from iPhone directly, these two ways have been introduced in this article, go and see it if you want to know more. All of the methods applied to iPhone 6 Plus/6/5S/5/5C/4S/4/3GS which run on iOS 8/7/6. Every time you sync iPhone to computer, all the data including App data like Viber, Tango, WhatsApp etc. on iPhone will be backed up and create a new backup file and all the data in the old backup file will be erased. Therefore, Don’t sync your iPhone with iTunes before undelete Viber messages and call history! Make sure you have installed the latest iTunes version on your PC. On the menu, Right-click your iPhone and choose “Restore From Backup”. It is simple, but some iPhone users would hesitate whether to do it or not, because this way will restore all the data to iPhone and at the same time it will wipe all the iPhone data. In other word, you did recovered lost Viber messages, call history to iPhone, but that’s mean you have to lose all the data haven’t synced to the last backup file, is it desirable to do so? 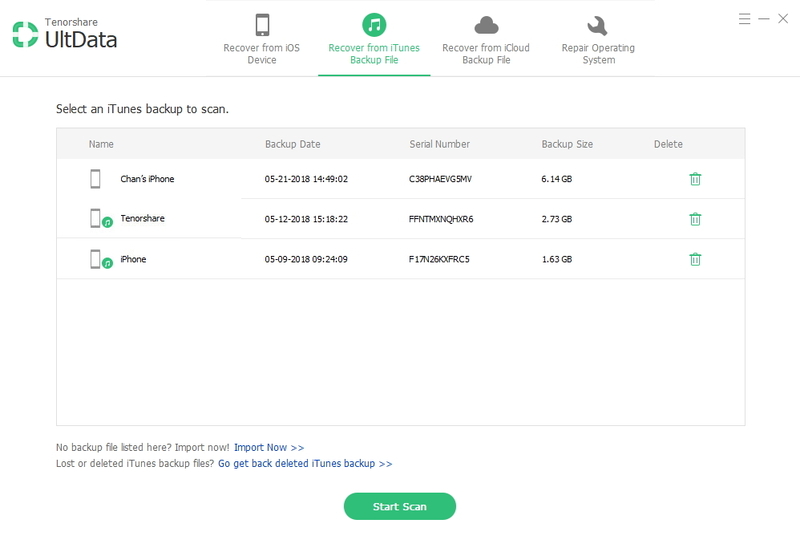 To solve most iPhone users’ anxiety, Tenorshare developed an iPhone Data Recovery tool to extract iPhone backup file and save them to computer, this tool allows you to restore 3 file in every kinds of file types under the recovery mode of iTunes, for more, you have to upgrade. Now let’s see how to works. This program will find all the backup files created on this computer and display, just click on the backup file name you need to extract Viber data, and click “Start Scan” button. When the scan is over, preview and check those Viber messages and call list you need, and click “Recover” button to save data on computer. Both of these ways are easy to handle, but Way 2 is better, except it won’t delete iPhone data, it can deal with some situations that Way 1 can’t do, such as iPhone was lost or stolen, broken, water damaged that won’t turn on etc. Thus, iPhone data recovery software is the best option to recover Viber messages, photos, contacts, call history on iPhone from iTunes!